The Little Portion Friary was started in 1982 when Deacon John G. and the Rev. Alexius realized that homeless men and women needed a homelike setting and a sense of personal involvement with individuals who cared about them. They envisioned a setting in which people from all walks of life would bring their talents and gifts, working anonymously and quietly, to help those in need. As they shared their vision and passion for this work, others responded. The Sisters of St. Francis, for example, provided furniture, bedding, and willing workers. Family members, co-workers, church groups and others responded generously. The Diocese of Buffalo provided the building, first as a rental and ultimately for a nominal selling price. At Father Alexius’ request, the Order of Friars Minor, Holy Name Province, authorized the establishment of a Franciscan community to be known as the Little Portion Friary. The name comes from the early history of the Franciscans. In the 13th century, St. Francis of Assisi, wishing to own nothing in this world, yet needing, a home for his growing community of friars, leased a little church called St. Mary of the Portiuncula, which literally means Little Portion. To Francis, the name represented the poverty, humility, and simplicity that he wished for himself and his followers. For Buffalo’s Little Portion, the name reflects a commitment to St. Francis’ ideals and hope of allowing our lives, in little ways to touch and be touched by the lives of others. From the beginning, the endeavor has been blessed by those eager to serve and to share. Some have come to clean and to paint. Others donate time to do paperwork, to greet guests at the door, to cook meals, to do laundry. Often donors have arrived at the door with exactly what was needed. Guests, who have come from most of the 50 states, as well as foreign countries, have given of themselves, by offering comfort and encouragement to one another in their struggles. Though the friary does not accept payment, guests have contributed by donating cans of food or an article of clothing. 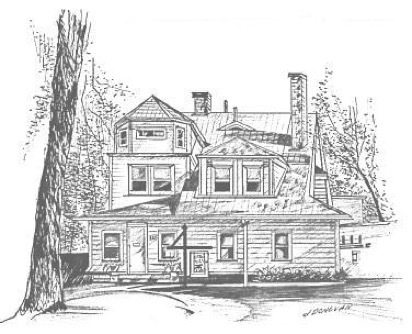 One early guest did a sketch that is used on the Friary’s letterhead. Little Portion has tried to provide a safe haven that is clean and comfortable so that guests can regain control over their lives. Those who volunteer here work together as a team, without publicity, positions or titles. Their goal is to provide a place where the needs and gifts of countless individuals could come together. What we’ve learned is that sometimes we’ve had to say “no,” and sometimes we gave more than we thought we could. Giving our clothing, toiletries and household items was easy enough, while giving structure and consistency has always been more difficult. With over 35 years, the Little Portion Friary continues to bring together workers, donors, and guest in an effort to meet the basic needs for food, shelter, and clothing, but also to see that each guest takes his or her own steps toward a more stable life. We depend entirely on the efforts of volunteer workers and remain in awe of the generosity that has sustained us this long. Please contact us to learn more.